A static method can only access static members in the class that it’s defined in. (If you pass an instance of an object to a static method, it can invoke instance members on that object). Trying to access instance methods or data from a static member will generate a compile-time error. If you wanted to access the instance method Bark(), how would you do it in your example? Jack, you can’t access instance methods–that was the point of the post. A static method is one that executes without knowing anything about any particular instance. 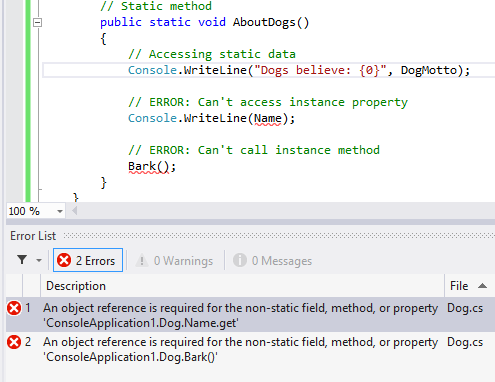 So if our AboutDogs() method is static, it’s not specific to any particular Dog instance. So calling Bark() doesn’t make sense, since we don’t know which Dog we’re talking about.